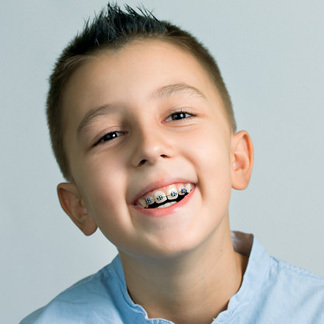 Braces with Dr. Weinberg can give your children the smiles they deserve. Dr. Weinberg gives each child in his care the same skilled, gentle treatment he provided his own children when they were in braces. Everyone in our office takes special care to make sure our young patients are comfortable and enjoy their time with us. At your first visit, Dr. Weinberg will personally evaluate your child's bite and talk with you about any problems he sees. He carefully considers your child's tooth development, age and other factors to make sure braces are in your child's best interests now or in the future. If braces are recommended, our team will give you the complete information you need to make the best decision for your child. Don't wait. Braces now can prevent dental problems down the road. Dr. Weinberg provides the latest orthodontic treatment for children and teens, including traditional silver braces and the newest “mini braces, ” the most comfortable braces available anywhere. Find out how Dr. Weinberg can improve your child's smile. Schedule an evaluation, today. Click here for more information about what braces can do. What's it like to have orthodontic treatment? Click here to learn about life with braces.